Looking for an extensive list of youtube animal channels. Check out this list of the Top 100 Pet Youtube Channels. There are tons of cat, dog, fish, multi-pet channels and more to watch out there . 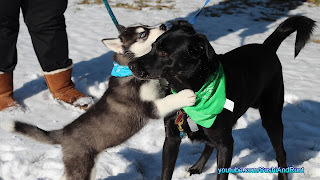 Sam meets husky puppy Niko. Before I produced videos for the Sushi and Runt youtube channel. I was a big fan of watching funny cat and dog compilations. Sometimes I would go down the rabbit hole and watch cute cat videos for way longer than a productive adult should. Because of this I know the value of pet videos and the joy they bring to the animal lovers who watch them. Please take a moment at let me know some of your favorite pet personalities in the comments below this post.